Brazil is one of the most promising online retail industries in the world, and the largest economy in Latin America, generating more than BRL 50 billion in annual ecommerce sales. 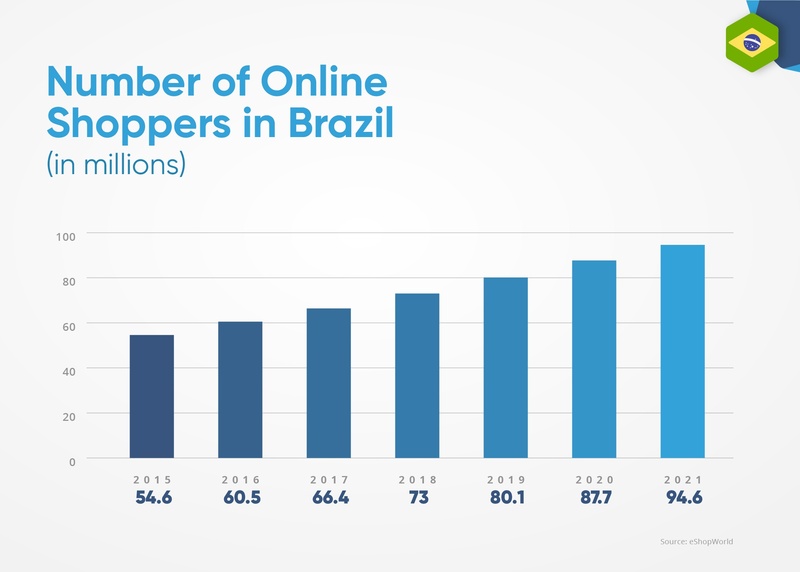 The brazilian’s online stores are booming and becoming a captivating market opportunity for merchants that understand global expansion is the answer to long-term healthy growth. Even if there were some turbulent times within politics and for the economy in Brazil, things are getting better and Brazilians purchasing power grew 3% in 2017. With a huge consumer market eager to purchase international goods and services, and where foreign culture is really present among a young population, Brazil is drawing the attention of savvy brands all over the world. Just so you know, half of the Brazilian population (around 100 million people) have purchased on international websites at least once, according to E-bit. Ecommerce giants like AliExpress and Light in the Box are investing significantly in this market, since it is cheaper for Brazilian consumers to buy from these international websites than from domestic shops, due to the elevated prices local stores need to charge because of the high taxation cost inflicted on them. Get to know the Light in the Box installments case in Brazil! We get that conquering a new market raises doubts and poses real challenges, but I’d like to show you that these challenges can be easily overcome with some planning and perseveration, and that Brazil can be the solution to stagnated online sales. Throughout this article I will focus on the state of Brazil’s e-commerce industry and market particularities to help you choose to invest in this promising country. The numbers are undeniable. 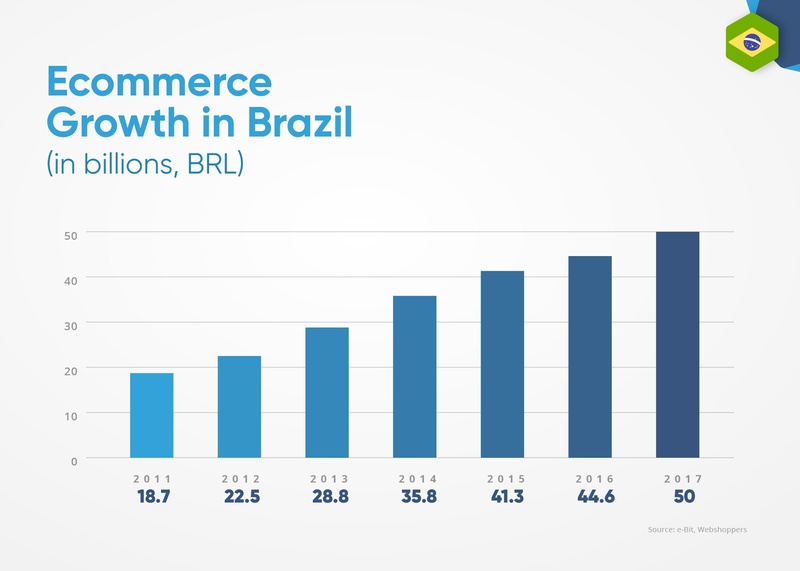 Brazilian ecommerce has been growing continuously over the last few years, as shown in the graphic below. Plus, according to a study released by Score Digital, a Visa’s research program, Brazilian shoppers made an average of 58,000 digital transactions per hour in 2017. You may think that the Brazilian e-commerce market is small, since it is still a little bit behind other ecommerce giants’, such as China and the United States. But don’t be mistaken, Brazil’s early stage in ecommerce leads to great opportunities that enormous and already established markets lack, like lower competition, more room to grow and even more acceptance to foreign products. Brazilians are, as a general rule, very receptive to international retailers. With internet usage rates growing continuously (Brazil is the 4th most connected country in the world with around 120 million users online), e-commerce in Brazil has everything it needs to increase even more over the next years and merchants from all over the world can benefit from this opportunity. All that said, I can assure you that now is the time for you to enter the Brazilian ecommerce market. In order to get a slice of the cake, brands must have a concrete understanding of how the market behaves and what drives ecommerce shopping in the country, as well as the most popular means of advertising and cultural buying habits. Keep reading to learn more about these important areas. 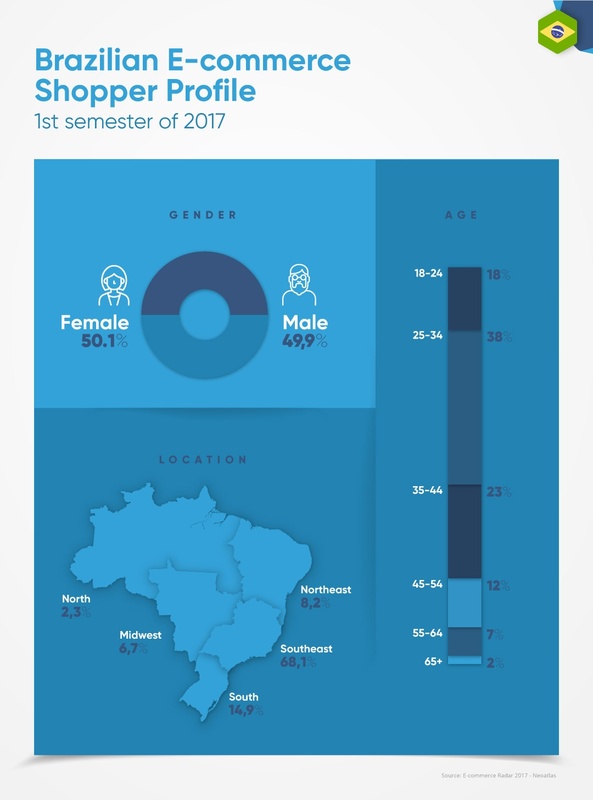 Brazilian ecommerce sales are mostly concentrated among the younger population, and the regions with the highest sales concentrations are the South and Southeast regions, reflecting Brazil’s internet and ressources penetration. Sao Paulo is located in the Southeast and is the main financial center in Brazil, thus we can conclude why consumerism in this region is more relevant than in others. 32% among the states of Minas Gerais, Santa Catarina, Goias and Rio Grande do Sul. Brazilian shoppers also increased the value of their spending in 2017, average spending rose from BRL 403 to BRL 418, according to the Webshoppers report. An interesting fact about Brazilian shoppers is that they prefer to buy from international ecommerce stores even though it can take a while for their order to arrive in their homes. They are accustomed to waiting for products ordered from China to take at least 30-60 days or more. Since products are cheap, even if taxation is applied during the product arrival in Brazil, it is still worth it for them to buy internationally. Mobile is growing exponentially fast in Brazil. In 2012 only 14% of the population owned a smartphone, in 2017 this number increased to 62%. According to the Forrester report, in 2017, Brazilian retailers said that 20% of their online revenues came from mobile sales, and 56% of them indicated that they would increase investments in mobile, forecasting a growth in mobile shopping. Moreover, research produced by an ecommerce news portal in Brazil has shown that 41% of online stores are prepared to sell through m-commerce and that sales made via smartphones represent about 10% of total sales to 384% of online retailers. Mobile payments are helping m-commerce to grow in Brazil. Google, for instance, recently launched an API that allows Android users to pay with only a few clicks using payment information they previously stored in their Google Account. 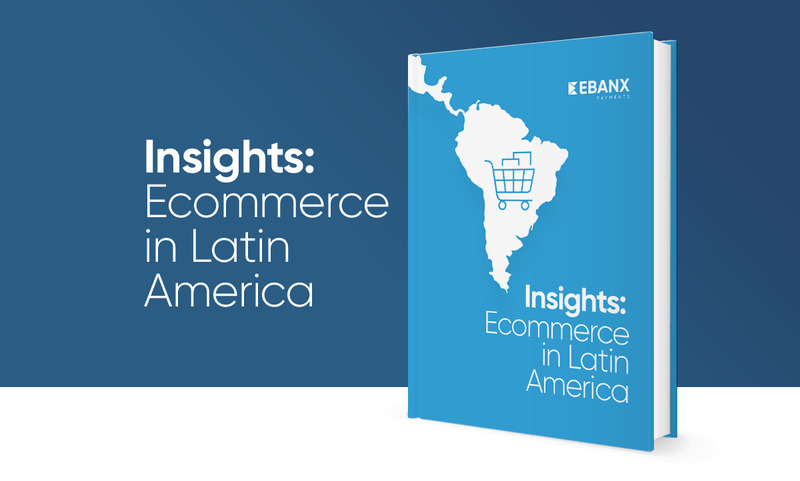 Through integration with EBANX, the Pay with Google API also accepts local payment methods now, increasing the product’s range in Brazil and boosting the mobile shopping fever. Another thing retailers should pay attention to when considering expanding to Brazil is social media. This is a very important, if not essential, element for all successful businesses in Brazil. With more than 103 million active social media users in the country, according to the We Are Social’s report “Digital in 2016”, savvy, social shoppers are changing the ecommerce market in the region. Being active on social media networks tells your customer that you have a solid business, one that cares about them and that can be easily tracked and reviewed. Also, social media makes it easier to turn customers into enthusiasts of your brand, all through the old mouth-to-mouth method. According to a research made by the Qualibest Institute, social media is part of the marketing strategy of 91.1% of companies in Brazil. The main reasons is to increase online visibility and interaction with the audience. Among the main benefits, Brazilian retailers link social media presence with more brand awareness, engagement, traffic and increased sales. The most utilized social media platforms by retailers in Brazil are Facebook (97.6%) and Instagram (63.3%), according to Qualibest. As a matter of fact, Brazil is one of the top 5 countries in terms of active users on Instagram. The Internet-based photo-sharing app had, in 2016, more than 300 million active users worldwide. From those, about 29 million were Brazilian users. More than 60% of companies in Brazil invest in a paid advertising strategy, with the intent of raising brand visibility, selling more and sharing blogposts and branded ebooks. Of this percentage, 98.5 % of businesses invest their money in Facebook Ads, which, being less expensive than Google Adwords, is a great option for small to medium size brands who want short-term results with a low budget. Ecommerce in Brazil is ruled by big players. About 70% of the Brazilian ecommerce market share is in the hands of the 10 main retailers in the country, according to the Sociedade Brasileira de Varejo e Consumo (SBVC). However, foreign companies have managed to conquer space by offering lower prices or bringing highly desired items that usually cannot be easily found in the region. Brazil has many options of shipping, the most common one being the Brazilian Postal Service, Correios, and couriers. Choosing the best mailing service is a very important step to include in your expansion planning, along with the best practices to prepare your product before the shipping process. For more information on this subject, I strongly advise you to read our guide on shipping to Brazil from USA, where I talk about courier services from the USA to Brazil, Brazilian Postal Service and other shipping methods in much more detail. Another important issue you must be aware of is the tendendancy of Brazilian strikes. When the federal Customs or Postal Service stops in the country, and it can happen often, it usually takes a while for things to get back on track and packages can take even more time to arrive at the final destination. But, don’t let this be a deal-breaker, just make sure you are honest with your customer about how much time he might wait. Taxation is also a recurrent topic when talking about exporting products to Brazil. The National Customs service can be very slow, taking up to 5 weeks before releasing the product to the customer and taxes can be applied. Note: Products under USD 50 are likely to not be taxed, however, this is not a rule. Import taxes are collected by the carrier and it is the customer job to pay them in order to receive their package. Conversion rates for international merchants can be lower in Brazil in comparison to big ecommerce markets. In order to strategize to come out on top, a solution for cross-border ecommerce businesses is to invest in local payment methods by partnering with a local payment processing company. This will help merchants increase credibility, reducing cart abandonment rates and improving sales. Cash Payments (Boleto Bancario) – The most popular cash payment method in Brazil is the boleto bancário. This is a result of the practicality and easiness this method provides Brazilians. They use it to pay for their monthly bills, such as electricity, water and even Internet. In other words, the boleto is a part of every Brazilian’s life. See how the boleto bancario works in Everything You Need to Know About Boleto Bancario. Domestic Cards – Credit cards are the most popular payment option in e-commerce. But, in Brazil, there is a tiny detail that may get in the way of your expansion. That’s because only 19% of the Brazilian population have credit cards that are enabled to shop internationally. That said, if your ecommerce does not accept domestic credit cards you are letting a huge market share slip through your fingers, since 47% of all Brazilian ecommerce payments are made using them. A local partner that acts as a local entity for you and establishes a connection between your store and local acquirers is the solution for this problem. Installments – Shopping and paying for purchases through monthly installments with credit cards is a really common payment method for all forms of Brazilian retail sales. This has been the process for ages, and ecommerce inherited it. By paying through up to 10 parcels, Brazilian shoppers are able to purchase high-valued items even if they don’t have the full amount yet. Bank Transfers – Another very popular payment method in Brazil is TEF, Electronic Bank Transfer. Brazilian shoppers that are frequent users of internet banking know that this is a fast, secure and practical way to make instant payments. When choosing this method, they are redirected to their bank’s internet banking portal and makes the whole transaction through there. The downside is that the customer must have this feature enabled and there can be maximum value limitations set by the bank. Expanding your business to Brazil can be done successfully if you act diligently and plan ahead before any action. Partnering with local companies and seeking professional local advice is crucial before launching your ecommerce business in Brazil. Enter with a strong customized strategy and you achieve increased sales.